Who Were the Movers and Shakers in Comics for 2013? In and out of the comics world, it’s been quite a year! For Ad Astra Comix, it was a year that we came to be. But how was our own growth reflective of the rise of political comics elsewhere? Listed below are the people, projects and titles that our contributors believe made the absolute best of the past twelve months, in many different ways. Follow the links to find out where you can purchase their work and learn more about them! Two Thousand and Thirteen was a big year for comics introspection. 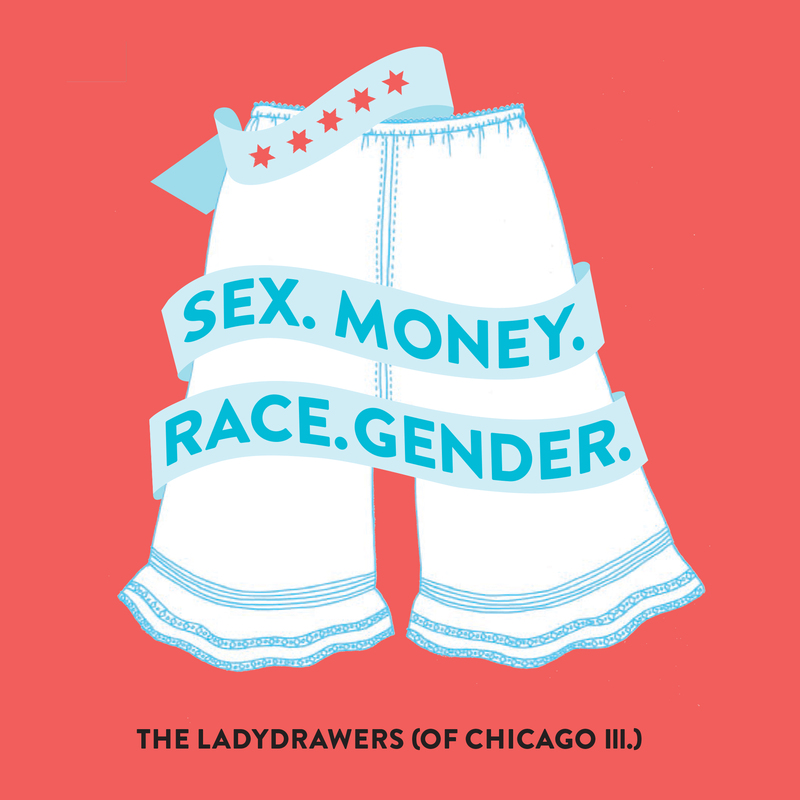 At the forefront of alternative comics, comics activism, and raising awareness about some of the deficiencies of the industry is the Ladydrawers Collective, who have gained a wider audience from their contributions to the progressive website Truthout.org. In addition to creating original works on topics as wide-ranging as feminism and unfair labour practices, the collective has curated comic art exhibitions, interviews with others in the comic industry around these issues, and given much-needed fuel to the fire calling for nothing short of a revolution in comics and the way we use them. Although founded in 2012, Black Mask Studios really heated up this year with a full slate release of titles from this new indie/political/punk publisher. Primary titles of interest: Occupy Comics and Liberator. 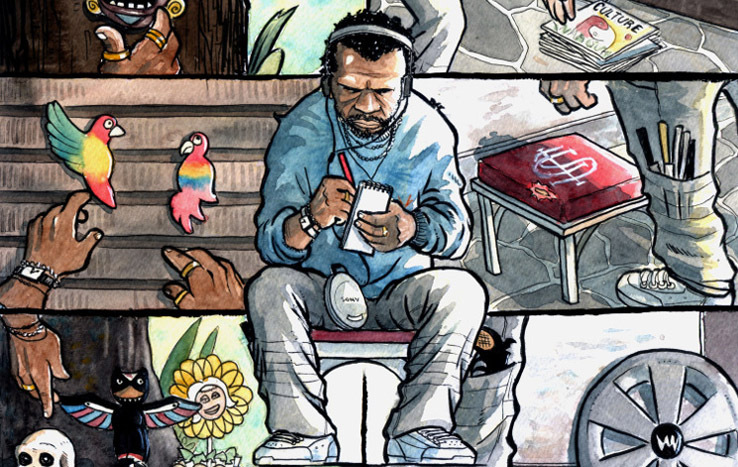 Occupy Comics (with 3 issue releases this year) has done much more than just tell the story of Occupy Wall Street. The series captures the feel of the movement. By reaching out to artists and writers from around the genre (Frank Miller need not apply). Occupy Comics offered powerful stories of struggle from early labour history, to OWS, Occupy Sandy, and other elements of the world wide movement for economic and social justice. Certainly there are “non-political” titles that Black Mask is investing in, such as Ghostface Killah’s and RZA’s Hip-hop crime drama 12 Ways to Die, or Ballistic, a futuristic adventure about a man and his pet gun. But perhaps one of the most innovative and notable actions of the studio is its distribution strategy. Actively seeking out an alternative audience as well as traditional comic fans, Black Mask has placement in record stores, alternative book stores and uses an online subscription model to reach their audience. Black Mask has brought a slate of avant guard and openly political offerings into the wider marketplace. Imagine: any average kid walking in to pick up the latest X-men or Batman (let’s face it: Superman fans probably weren’t interested) could see titles that made no bone about their politics of Animal Liberation, punk rock anarchists or the 99% sitting proudly beside old favourites. The times, they are a-changin’! But the evolution of political comics is certainly not limited to North America, or to the new issues rack at the local comic shop. If you live homeless in 2013 Brazil, you face extreme risks. The country has an incredibly high murder rate for its most vulnerable citizens, and they aren’t getting a lot of help. A true case in point: last year, eight homeless people were poisoned when a passerby gave them a bottle of water spiked with rat poison. Shedding light on this dark and treacherous life, Brazilian creators Augusto Paim, Bruno Ortiz & Maurício Piccini created an interactive webcomic that–for a day–puts you next to Jorge, a 43-year old homeless man from Porto Alegre, Brazil. So Close, Faraway! a self-described “interactive piece of comics journalism,” is a pioneering effort that stretches the capabilities of the comic medium while forcing us to look at a social issue we often ignore. 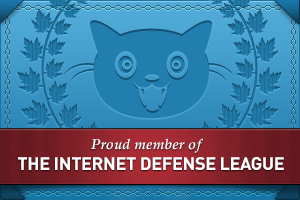 Vigorously researched by Paim, the SCF! combines the story of Jorge’s life with real statistics about homelessness in Brazil, like those mentioned above. Ortiz’s art reminds us of the tropics in that it seems almost two bright, yet startlingly accurate, even in the blur of the final page. There are also multiple photos that demonstrate that the artwork rarely takes any liberties, and the harsh conditions on each page accurately reflect the harsh reality of homeless life in Brazil. Bringing the story of Jorge to the online space is computer science graduate Piccini, who creates each page in layers that let you add or remove statistical or story dialogue boxes to give you some freedom as to how you read the comic. There’s something empowering about having control over the text on a comic page, allowing you to appreciate the art, and giving you the chance to read as deeply into the details of the story as you like. From left to right: Nate Powell, Congressman John Lewis, and Andrew Aikin standing on the bridge where police had beaten Lewis and his comrades decades before. The scene is depicted in March: Book One. John Lewis is perhaps one of the few members of American Congress who deserves to be there. As a leader of the Civil Rights Movement and the only person still alive to have spoken alongside Martin Luther King at the Washington Monument rally in 1963. And so kudos to him, Andrew Aikin, and the rest of their team for recognizing that the way to pass on this important chapter of American history—a history so often white-washed and told to have a happy ending—is to tell it as children and young adults like to learn it: with comics (electronic orders of this title, available through Top Shelf Productions, even include an electronic copy of vintage comic Martin Luther King and the Montgomery Bus Boycott, a 1950’s-era title that inspired Lewis to re-visit the medium). March: Book One shows us that our history is beautiful, terrifying, and can be powerfully relevant to our own lives. And who else could illustrate this with more grace than comic artist and illustrator Nate Powell? If a comparison is acceptable, Powell is also another hard-working person who uniquely deserves every ounce of credit for what he has achieved in his life. After self-publishing comics since he was 14, Powell completed a few critically acclaimed and award-winning works like Swallow Me Whole, The Sounds of Your Name, and recently more politically-charged work like The Silence of Their Friends, and Any Empire. In 2011, he appeared at the United Nations alongside the world’s foremost writers of young adult fiction, to present on his contribution to the anthology What You Wish For: A Book For Darfur. 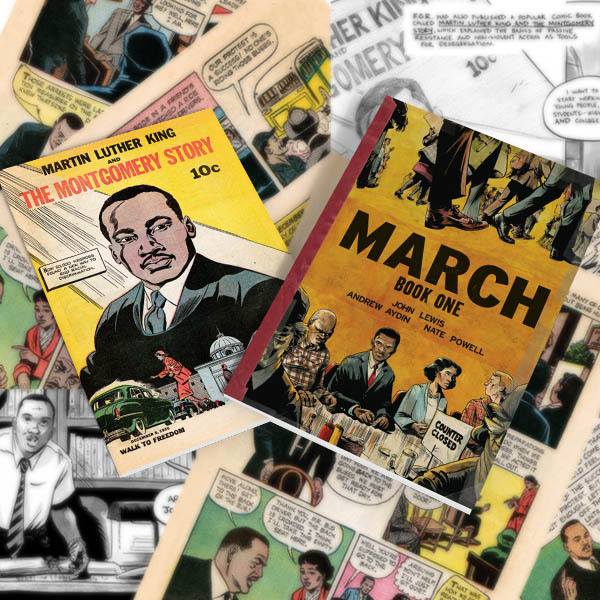 As John Lewis, Andrew Aydin, and Nate Powell so eloquently show us in MARCH, the Civil Rights Movement was a bloody, uphill battle, and should be remembered that way. The struggle and its gains were not the results of a few actions by those now famous historical figures; the movement moved and shaped by thousands of committed activists, many of whom were students, and many of whom lost their lives. Gene Luen Yan’s Boxers and Saints is a hugely innovative and visionary dual graphic narrative for all ages, from First Second Books. Using cutting-edge creative technique, we can now begin to think about history (and comics) in a very different way. They are in fact, two separate but complementary graphic novels, Boxers, and Saints, that challenge a traditional black & white world-view. They are also available together as a boxed set and share trade-dress (including connecting imagery on covers/spines), and the reading of both is highly recommended to fully appreciate the richness of the larger world and the historical backdrop of China’s Boxer Rebellion. Even though Boxers is the heftier of the two physical volumes, both are balanced in substance. Yang has tackled the problem facing anyone trying to fairly depict two sides of a conflict, and finds a rather eloquent solution: each is given it’s own stand-alone (albeit interrelated) story, and it’s own protagonist. Boxers tells the story of Little Bao, an ignorant farm boy turned rebel leader, while Saints follows a young Christian girl, whose lowly status does not merit a proper given name until she chooses her vocation. The two meet only briefly, but with significant repercussions on the lives and ultimate fates of both. In addition to being a critically acclaimed and award winning Graphic Novelist (American Born Chinese won an Eisner and other honours in 2007), Yang is a high school teacher. He shows deftness and ease at breaking complex concepts and events into accessible, yet entertaining, ways for his primary audience of children and youth. He crafts fictionalized version of very real events, using what we as adults might liken to “Magic Realism”. It’s not surprising that Yang also writes the graphic novel adventures of Avatar: The Last Airbender. He has essentially turned his protagonists into superheroes, while the very human reactions of his adolescent characters remain easily relatable to young readers. Yang’s work pushes the boundaries and demonstrates the potential of the medium. Boxers and Saints highlights the complexities and ambiguities of political/social/economic conflicts, and illustrates to his readers that the world isn’t cleanly divided into “good guys” and “bad guys”. For those unfamiliar, Tom Humberstone is an award-winning comic artist and illustrator based in London. 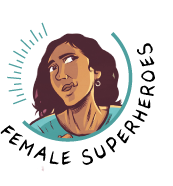 This year, he launched the platform Female Superheroes on femalesuperheroes.nl (with access in English and Dutch), featuring inspiring stories about ordinary women from around the world, who face great adversity and overcame it to do extraordinary things with their lives. The platform is unique because, “it showcases how Comics Journalism can be combined with a game-like interface, 360-degree photography and video to create an immersive experience”. Pretty awesome. 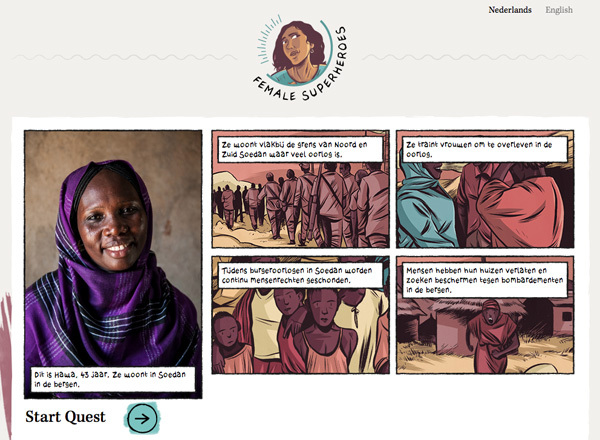 Screenshot of the interactive Female Superheroes website, available in English and Dutch. For better and for worse, Fowler arguably made less waves with her incredible artwork this year than for her calling sexist foul on Brian Wood, a leader in the mainstream comics industry for sexually harassing her during a comic convention social. Open letters such as hers and other women in comics (most recently comic artist Mari Naomi re-lived, in comic form, how she was repeatedly sexually harassed during a panel at a comic convention) are pointing to a deep and powerful undercurrent of male chauvinism in comics. Certainly, these talented women would like to focus on what they love doing most, which is telling stories and drawing comics. But for the purpose of this post talking about who has had the most significant impact on comics from a political perspective, their public positions against harassment in the industry have been huge. The ripple effect of these public-yet-very-much-“inter-community” criticism is going to be felt for years to come, and has very likely changed the titanic course of the comics industry as we know it. The letters, each as they pop up, have obviously been constructed with great caution and forethought, but ultimately released for the betterment of the comics community, and are therefore courageous and worthy, more than any other buzz news or gossip, of our time to read. At the Toronto Comic Arts Festival this year, I posed a question to a number of comics creators: Why has Comics Journalism taken hold so well in comics, but so poorly as a quote-unquote “legitimate” form of journalism? The response of many was that, to the contrary, no one has said that comics journalism isn’t legit. My response in turn, was that we still can’t open up 99% of our printed media in North America to find an example of this incredible genre. 99% is probably generous. 99.9%. Symbolia Magazine had a rebuttal for me. Here is a magazine that is entirely devoted to Comics Journalism, or Cartoon Journalism. The publication is a pay-per-issue or by annual subscription, available for online viewing through interactive PDF’s. Another term for interactive is best thing ever. There is such a huge variety of work available here, from artistic style to focus of journalistic investigation. Whereas most of the work (that I’ve read thus-far) does not include the journalist in the story, there is a strong sense of personalization nonetheless through the images that depict the subject of the accompanying words. Subjects range from war to the story of an artist who wanted to build the world’s first museum devoted to insect genitalia. The focus isn’t politics or making stories personal. The focus is simply comics journalism, which lends itself to exploring a wide variety of topics from the beginning to the end of each issue. Definitely check out Symbolia, if you haven’t already. I plan on continuing my subscription and reviewing individual pieces as they come up.